This week we are having ocean themed fun every day!! Today we are sharing a simple shark alphabet game that all three of my kids (ages 6, 3, 1) enjoyed. They even helped me adapt it so that it worked for all of them. My favorite ocean animal is a shark! I have loved studying about sharks since I was little and so I was really excited to discover that my toddler is also a big fan of sharks!! 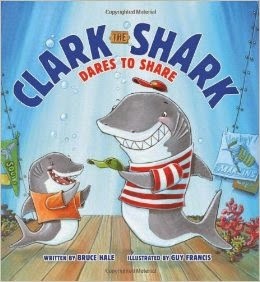 Recently Harper Collins sent us Clark the Shark Dares to Share by Bruce Hale. My preschooler has loved listening to the story but my toddler is the one who is obsessed with the book. He isn't able to sit and listen to the whole thing yet, but he loves to carry the book all around the house and look at the photos. He even learned how to say, "shark!" The book talks about Clark the Shark's experience as he learns about sharing at school. At first he is really confused, but then as he meets different characters he learns more about how to share. Our favorite part of the book is all of the silly character names! Since we've been obsessed with sharks lately we created our own cardboard shark and used it to play a simple alphabet and color game! To get started you'll need to cut a shark head out of your piece of cardboard and then cut a mouth out of the center. Next tape some shark teeth around the whole mouth. 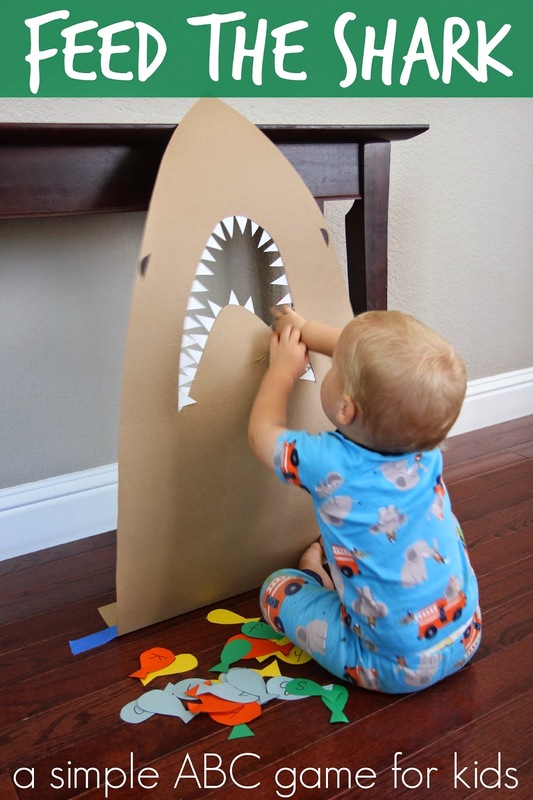 Turn the shark over and then use painters tape to secure it in place up against a table, box, or anywhere else that will allow the shark to stand up and still have some space behind it. Next you'll need to cut out some fish shapes from cardstock and then add numbers, letters, or sight words on each fish. My 6-year-old did lots of cutting for me for this activity. I did alphabet letters for my preschooler, sight words for my kindergartener, and then just left some blank for the toddler fish so we could work on color words! Once all of the fish were cut we put them next to the shark and then I let the kids just explore and play!! My toddler started stuffing the fish in the shark's mouth immediately while my other kids looked at the letters and words on the fish first. I loved watching how my daughter would stick a fish in the shark's mouth and just randomly talk about the alphabet letters she was finding while she explored. While she explored letters my toddler explored colors. Every time he put a fish into the shark's mouth I would tell him the color. After a little while he started telling me the colors of each fish that he picked up. Sometimes he was right, sometimes he was wrong, and I just kept using the right words as he talked... and by the time we were done, he was mostly saying the correct words for the color letters. He even did some color matching! My toddler enjoyed this activity the most out of all of my kids. He just loved dropping all of the fish into the shark's mouth and then once they were all in, bringing them back around to the front of the shark and dropping them in again... and again. I love it when I created an activity that is not only teaching something, but it also really fun for the kids to play! I was actually surprised at how much they enjoyed this activity and how long they played with it... considering how simple it is. Do you have any other favorite ocean themed crafts or activities you could share with us? Head on over to our Ocean Week landing page to see the other activities we've shared this week. Also, don't forget to head over and enter to win a PaddlePak backpack for your little explorer!! There are nine different paddlepaks to choose from and all of them go along perfectly with our ocean week theme!! Disclosure: Thanks so much Harper Collins for sending along a free copy of Clark the Shark Dares to Share by Bruce Hale for us to review and enjoy together. Awesome!! I have a preschooler who also loves sharks!! I LOVE this. My toddler loves fishes, and she is just starting to get the hang of ABCs and 123s. I think this would be great to share with her! I Love this. My granddaughter who is 2 loves games. Her 5 year old brother can help us make the shark and cut out fish! Brilliant and thanks! This is super cute! Shared on Google + and FB! This is so cute. My two year old would love this... while my six year old would love the making of it. This is adorable! My 3-year-old would love this, and it's perfect for our upcoming trip. Thanks for the great ideas! Cool idea! We just made ours today and it turned out well.